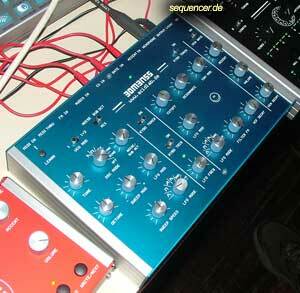 New Sequencer – Neuer Sequenzer von FR.. The Orb provides separate 1/4″ jacks for the CV out (1V/oct standard) with adjustable Glide Time control, Gate out (positive polarity type, 0 to +12V), and Accent out (positive polarity type gate, 0 to +10v) for playing most analog synthesizers. Or if you prefer, the Orb can act as a MIDI to CV converter allowing any MIDI keyboard/controller, or sequencer to contol an analog synthesizer. It’s also possible to sync most pre-MIDI analog sequencers and arpeggiators to MIDI clock by using the Gate out signal as a programmable clock source. MIDI In/Thru/Out are all provided for syncing playback with external sequencers, playing MIDI sound modules, or using the Orb as a MIDI to CV converter.